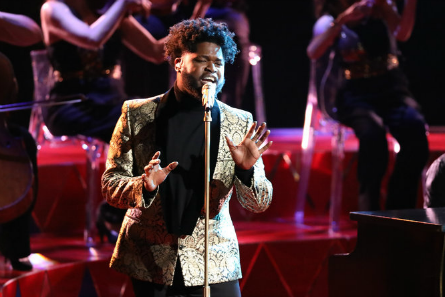 In the third week of “The Voice” Live Shows, the artists performed songs that inspire them as singers. This included an interesting mix from 1980’s songs to spritiual songs. And, of course, shoes were thrown again this week! The down side is that two artists left at the end of Tuesday’s Results Show, leaving us with The Voice Top 8, getting us one more week closer to the crowning of a season 13 winner. Some of the artists really gave it their all and really wowed us. 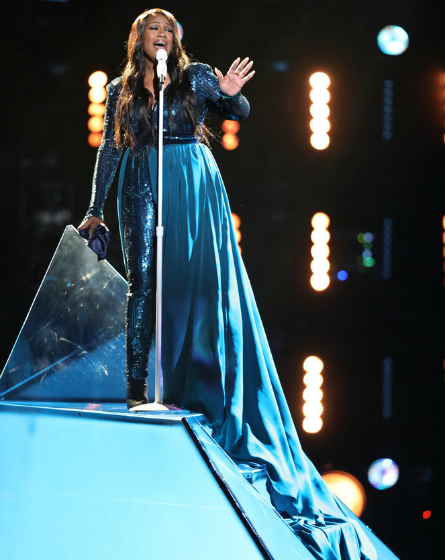 Stand-out performances came from Brooke Simpson who proved once again she’s a power-house to be reckoned with and even gave us mini-Jennifer Hudson vibes while singing a welcomed classic. 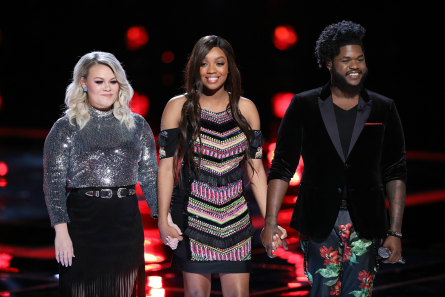 Then, Team Adam’s Addison Agen astounded at only age 16 and proceeded to blow everyone away with her creativity of a twist on Pop singer Britney Spears’ song. Team Blake’s Keisha Renee impressed with a beloved Celine Dion song and took it to the next level. First up, to start-off Monday night’s Top 10 performances was Davon from Team Jennifer. Adam commented “a female vocalist would have a hard time with that.” It blows him away how effortlessly Davon did the performance. Blake said “if you’re not in the Finals, that’s ridiculous.” Jennifer lost her shoe when she threw it at Davon during his performance. Jennifer told Davon that he represents everything that “The Voice” is about. Adam was in the bottom two with Janice last week and shocked when his name was called that he was moving-on. He picked the song because he got feedback from fans who wanted to hear him get back to Country. “Maybe it was Memphis” is the song he chose. “I love Tennesse.. how the air smells,” Adam said the song is reminiscent of home. Blake called it an “iconic song” and he did a great job. Miley told him no hard feelings since it was hard to loose Janice from her team last week. Coach Adam Levine was wowed by Adam’s performance. He observed that Cunningham has managed to save himself with HIS song choices, and not Adam’s. So, he let him choose this song this week. 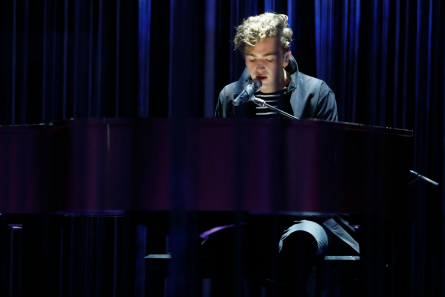 Noah proposed to Jennifer to sing Duran Duran’s “Ordinary World” stripped-down and opened the performance while playing the piano. She told him that the song needs “a little bit of thunder, and rumble.” So, he added distorted drums to his performance. Miley told Noah that she really loved his perfromance. “Really beautiful, nice and simple way for you to perform.” She called him a “great performer.” Coach Jennifer said “well, you did that honey!” She commented that she got to go on his journey with him and said it was like hopping on the Noah train. ShiAnn is a 15-year-old pop singer. ShiAnn chose “Diamonds” song by Rihanna. ShiAnn said the song is about letting her light shine through the darkness because she’s shy. Jennifer said ShiAnn has the potential to be a Mariah Carey. Adam called ShiAnn the “most improved player.” Blake said the character in her voice is his favorite thing about her sound and performances. He predicted that she’ll stand-out on the raido. Jennifer said she heard a little bit of Mariah and it’s cool to see her do a song of her generation. Blake Shelton performed with girlfriend and former ‘Voice coach Gwen Stefani. Blake told Chloe that she’s still number one on iTunes. It happened in minutes. “Call Me” by Blondie is the song that’s on Chloe’s playlist. She’s captivated by Blondie’s fierceness. Blake said it’s time for Chloe to show that she can rock and it’s the perfect song for her at this time. Blake said there’s something magical about Chloe’s voice and she has that thing that she’s a star. Keisha chose “All By Myself” by Celine Dion. She said Celine has gotten her through some hard times. The song inspired Keisha to go back to her roots and infuse it with Country. Blake said the song gives her a chance to show the world that she’s a “world class” singer. Jennifer was speechless. “There isn’t much else to be said other than congratulations and amazing performance.” Adam told Keisha that he’s proud of her and spoke about hateful comments spoken by “cowards.” She showed them! The Zac Brown Band tweeted Ashland that she “killed it” last week. During rehearsal, Miley stated that there’s an Ashland in there that’s more firey. Miley gave her a Joan Jet song because she’s Miley’s mentor and said Joan Jet is a revolutionary, an “attitude” and is what Ashland is going to have to bring this week. Jennifer said she was proud and has always been a fan and has “found her stride” and knows exactly who she is. Miley pointed-out that it was an all-female band playing for Ashland who did an awesome job at bringing the rock-n-roll Country. Brooke took everyone to church when she belted-out a semi-accustic performance. She received a well deserved standing ovation from the coaches. Jennifer said to sing a place like that, and to touch our hearts like you did” she is grateful to witness and see her voice to get this type of platform. Blake responded “it can’t get much better.” But as an opposing coach, credited her for taking it to the next level. Coach Miley said she won’t have to be heart-broken over Brooke leaving because she won’t be going anywhere! Red sang “What I Love About Sunday”, a song which he said mirrors his own life. Red said everything in the song literally is everything that he did in his life. He knows the writers who attend his church as well as wrote him into the song. Jennifer called Red “loveable” who can’t do no wrong. She called him “all of that and then some!” Blake said Red will be around for a long time for the show and after because he has a gift of telling a story. Addison who is 16-years-old killed it with an original take on Briteny Spears song “Lucky”. During rehearsal, she was trying to figure out how to make the song her own. She decided on a stripped-down version of the song. Adam said Addison shows creativity and he just has to trust her as an artist. 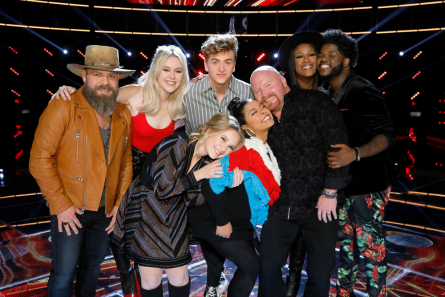 Night two of week three’s “The Voice” Live Shows included a special performance from ‘Voice veteran Danielle Bradbury, winner of “The Voice” season four from Team Blake. The artists revealed as The Bottom Three later in the night, had to perform for Instant Save votes, which left one remaining after two were cut. 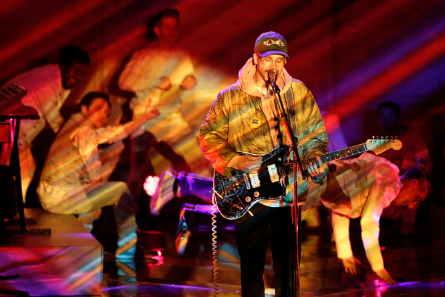 The coaches talked to their artists about their break-out moments and how they handled it. Next, host Carson Daly brought the “The Voice” Top 10 artists out onto the stage. Daly also announced that four of the artists hit the top 10. Booke said she’s thankful for Miley and her trusting her with that last song choice. Keisha said “stay true to who you are. If it ain’t broke, don’t fix it.” Daly read the card with the name of the first saved artist who was Brooke Simpson (Team Miley). The next saved artists were Team Adam’s Addison Agen, and Adam Cunningham. The remaining eight artists came back out to the stage. Daly asked ShiAnn Jones how has Jennifer helped her blossom. She answered that Jennifer’s helped bring her out of her shell and sing better. Daly asked Red Marlow what he’d like to say to his fans back home. Red said the support means the world to him. The next two artists saved were: Keisha Renee (Team Blake), Noah Mac (Team Jennifer). Reba McEntire made a pre-recorded announcement about the upcoming winner of “The Voice” season 13 would come perform with her. “The Voice” gave an update on last season’s winner Chris Blue. He signed with Republic Records and with Alicia Keys. He married his fiance. 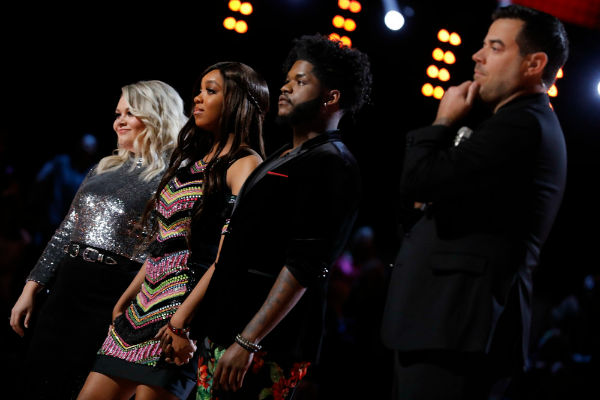 The remaining six artists returned to the stage to hear their fate. Daly asked Davon about his performance. He said it means everything to receive positive feedback from the coaches. He said he was number one on the R&B soul charts. Chloe said in moving forward she doesn’t look too far ahead and each time, “it’s brand new” and she doesn’t like comparison. The next artist announced as saved was Team Blake’s Chloe Kohanski. “The Voice” season 4 winner Danielle Bradbery who was on Team Blake returned to “The Voice” stage to perform “Worth It”. Ashland Craft said she’d like to show America her softer side. The save vote went to Red Marlow from Team Blake. The bottom three artists left were: Ashland Craft, ShiAnn Jones, and Davon Fleming. America’s Instant Save Vote would save one tonight and send two artists home. Ashland told Miley that she’s so thankful for her pushing her to be the best she can be. ShiAnn thanked Jennifer for supporting her and her dream. Davon told Jennifer thank you for investing in him. Miley told Ashland that she came as “an amazing Country star.” But, has loved watching her grow in her confidence and sing in such ease and grace. Jennifer’s words to her artists were regardles of what happens, is think about where their talent has taken them and they are in charge of when it’s over. No one can take their dream away from them. But, do it “becasue you LOVE it” Jennifer finished.